The rain cometh last night battering the tent but I was snug in my new sleeping bag. The morning brings forth sunshine and the air is heavy with mists as the water returns to the skies in its never ending cycle. If the forecast is correct sadly this water will return this very day. However we are currently bathed in sunshine and I am always grateful to be able to decamp or camp up in the dry. It makes for a much more pleasant and relaxed camp experience. 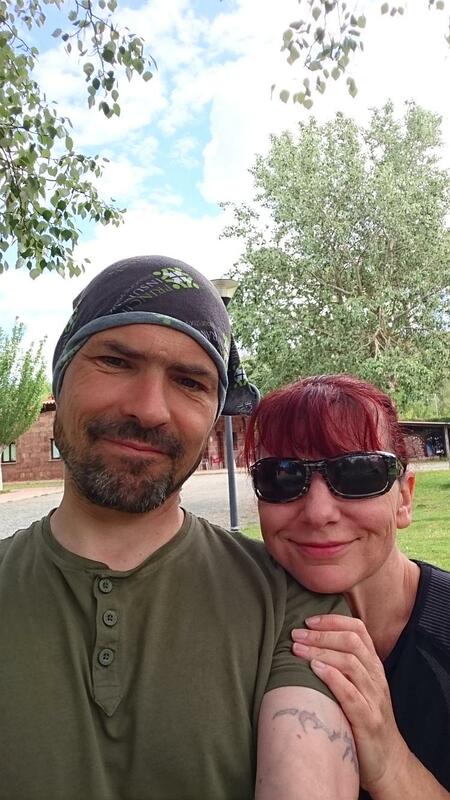 I really adore Camping La Viorna but we have other places to explore so it is time to move on. 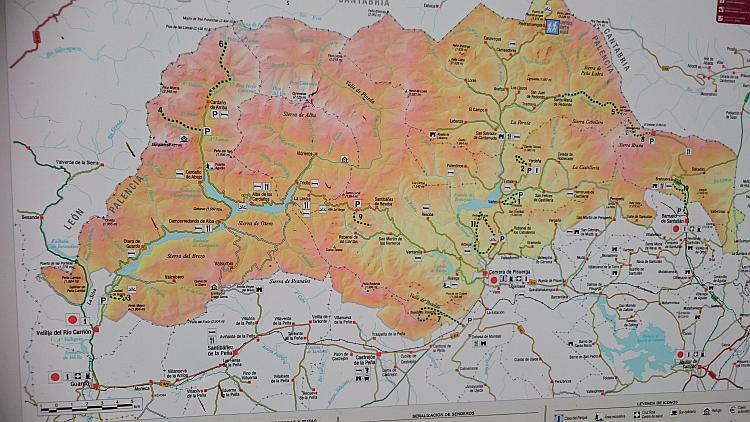 Our planned destination is inland to Burgos and the out of town Campsite of Camping Puerta de la Demanda. 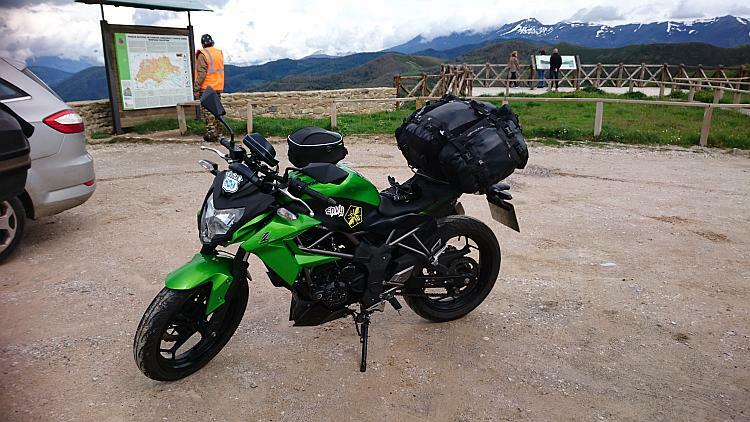 We shall be riding from Potes in the Cantabrian province to Cervera de Pisuerga in the Palencia province. 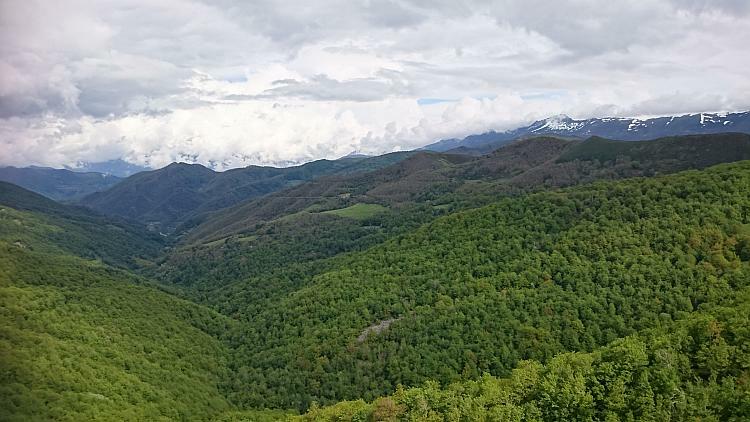 The provinces are divided by the Cantabrian mountain range and it is the twisty mountain pass that threads its way through this range that will be today's delight. The CA184 leading from Potes does not disappoint. The twists and turns are so numerous even a slow learner such as I is getting so much practice that I am already beginning to improve my cornering skills. We turn onto the CL627 and the mountain pass winds it's way up to around 1350 metres above see level. We spy a carpark and pull in for a stop. The Mirador De Piedrasluengus viewpoint has a wooden decking area from which to stand and admire the spectacular views of the nearby peaks. 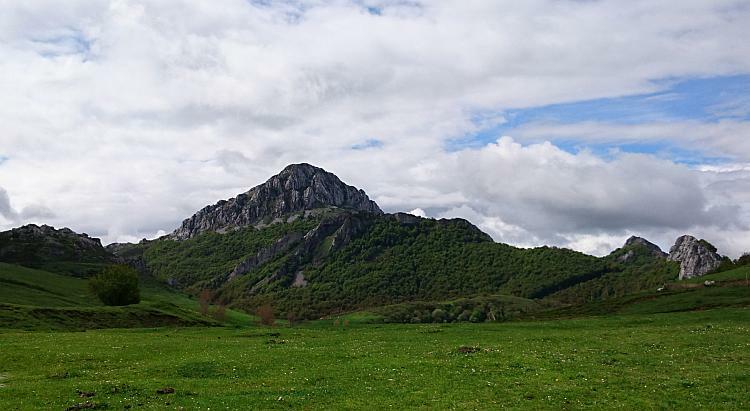 The Cantabrian mountains are composed of sedimentary rocks, primarily limestone with sandstone and shale. The limestone outcrops form fins or ridges that I think resemble the spines of crouched dragons or slumbering dinosaurs. The foothills of the mountains are densely forested. Beech groves dominate the highest altitudes giving way to more mixed woodland on the lower slopes. A rich diversity of trees reside here including Oak, Hazel. Chestnut, Walnut, Bay, Elm, Lime, Ash, Yew and Birch. Forests of a dazzling variety of trees. These dense forests and rugged peaks are home to Chamois, an agile goat-antelope with short hooked horns. There's wild boar and wild cats. Therer's also rare brown bears, reportedly around 60 in number and even rarer wolves around 20 in number also trying to find sanctuary here. The skies above are the kingdom of Griffon Vultures. I see non of this fauna but I know they are there somewhere hidden within the abundant flora. What I do spot is my namesake on the map on display here. Pico de Las Lomas is a mountain within this range with a height of 2444 metres. My maiden name was Lomas. Lomas often appears as place and mountain names within Spain. My father had olive skin that tanned easily to a nut brown, which my sister inherited. I got the burn easy auburn haired skin of my mother. However like my sister I have the dark brown eyes and the B blood group of my father. Although rare in the UK B blood groups are common within the Mediterranean. Add this to my love of sunshine and high tolerance to heat I like to believe I am actually of Spanish decent. My sister on appearance often got taken as a local when we visited Spain in our youth. Plus I have to say I feel so very at home here. If you look closely you can find me at home here. 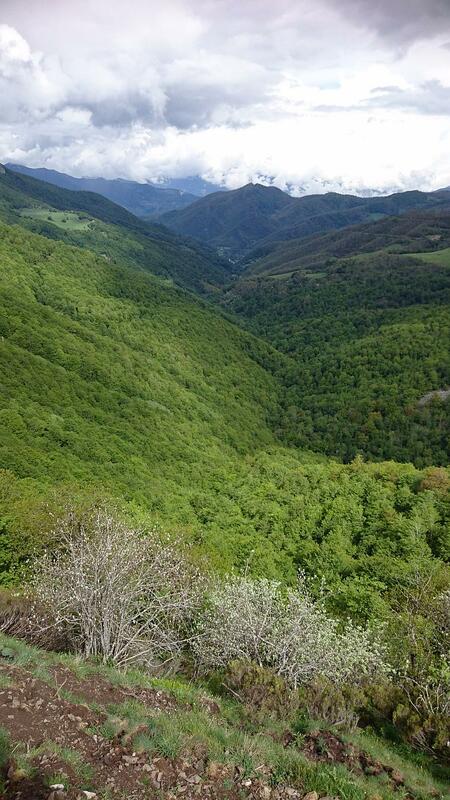 Back on the bikes and the road continues to meander its way through the mountains to Cervera de Pisuerga. We stop here for a stretch and to hunt down a toilet. 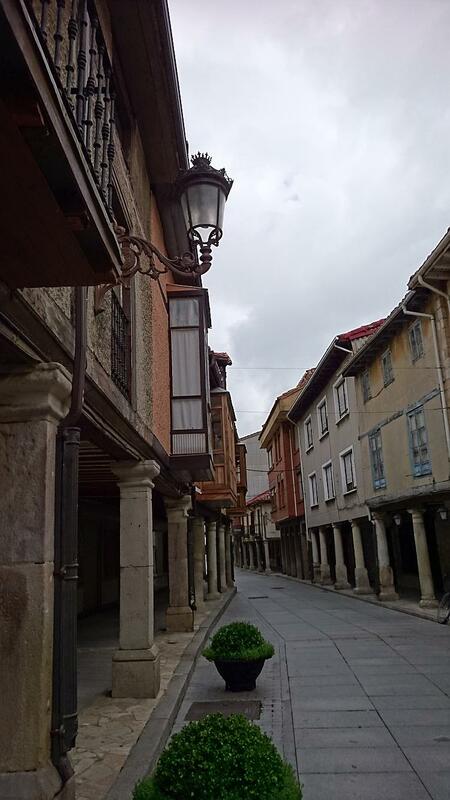 Cervera de Pisuerga is a pleasant small town situated 1000 metres above see level and surrounded by mountains and lakes. Located on ancient Roman roads the town still displays it's historic past. The squares stone columns date back to the 16th century. Fortunately this ancient town has modern facilities and a toilet is located within the tourist office. As we return to the bikes the skies darken to a leaden grey. We pull on the waterproofs just in time and the heavens open. The roads straighten, the mountains flatten and the rain continues. Hmmm. We reach the outskirts of Burgos. It is a busy modern town. Shopping centres, high rises, traffic. HMMMM. This is not my idea of fun now. I hate riding in busy cities wherever they are in the world. We fuel up and then park up in a large carpark situated under a shopping mall. We can get something to eat here both for now and for cooking this evening. McDonald's is heaving. Kids are everywhere and it suddenly dawns on me that this is the weekend. No wonder it is chaos. After waiting an age at the self service we find it doesn't like our foreign card. Arghhh. Ren then has to join the other queue at the counter while I hoover around the tables to try and find a spare seat. When one finally appears I have to race a small child to secure it but hey its McDonald's on a Saturday it's a warzone ok. I am grateful to return to the bikes and get the hell out of town. I want to escape this cacophony of sounds and return to silence. There is note attached to Ren's bike warning us that we should not leave our bikes here loaded with our gear. It sends chills down my spine. 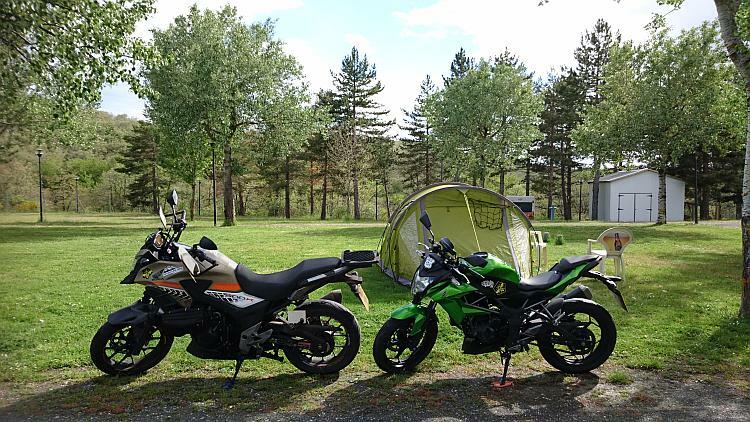 Imagine if we had returned to our bikes completely stripped of all our camping gear and clothes. Imagine if we had returned to a empty parking bay, no bikes, nothing. I hate cities even more right now, I want out of here asap. The rain has stopped but the skies still look uncertain so I keep the waterproofs on. I'm happy again once we leave the city behind. I saw a programme once about human's evolution. It said some humans today have a specific gene that enables them to live and feel comfortable in cities. The city gene made it easy to be relaxed in crowds and enclosed spaces. Some of us do not have the city gene. It doesn't take a genius to work out the I have a anti-city genes. We reach our chosen campsite, a little apprehensive as to whether it will be open. It is, wahoo! Campsite Puerta de la Demanda appears a little, well err ordinary after the splendid Caming La Viorna. But it is pleasant enough and is certainly quiet. 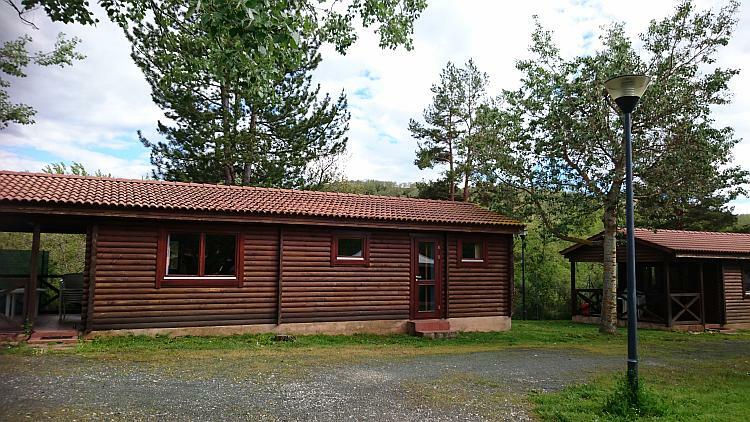 There appears to be another guest in one of the wooden lodges but that is it, we have got the place pretty much to ourselves. 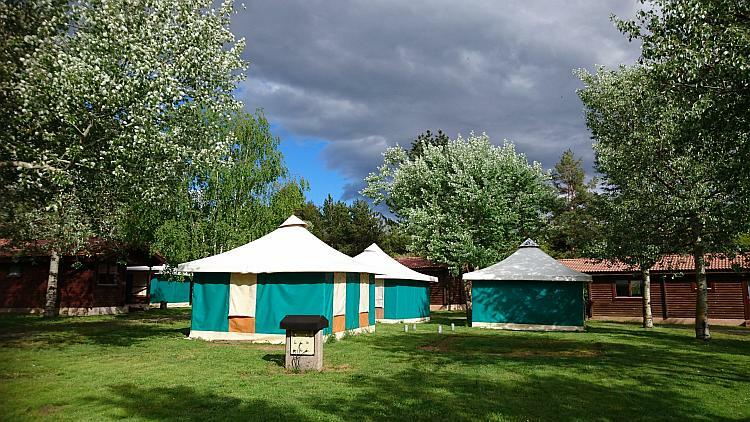 As well as several lodges on site there are also large safari type tents for hire. There is a very handy onsite bar and restaurant and covered drying area for clothing. It is little touches like this that is always appreciated by the damp and weary traveller. If you don't have your own tent it's no problem here. After pitching up we decide to call into the bar for a drink. There is however something I must do first. After all I don't want to scare the locals. There is a very good reason why I was so delighted to find hair straighteners that could be charged from my bike. This reason is currently very obvious. 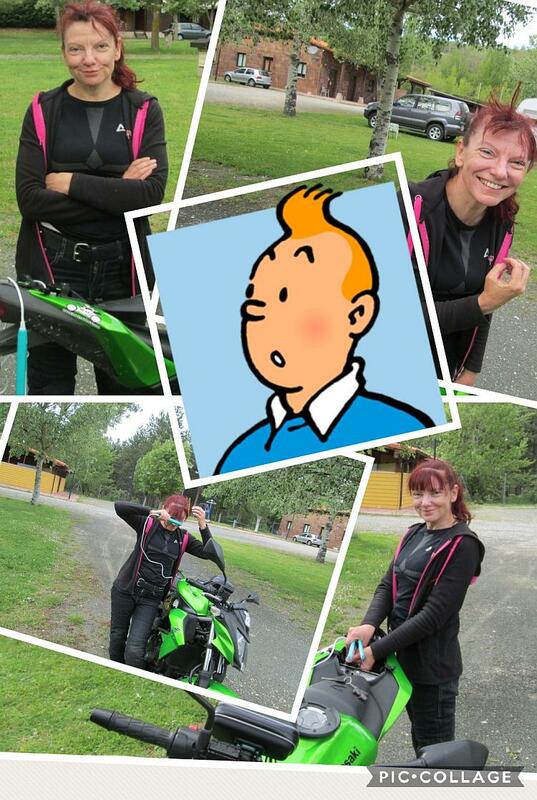 The combination of a full day in a helmet and rain manage to transform me into Tin Tin. Today has been mixed, it started well but then got wet and a bit miserable in the city. However as we stroll back to the tent in the sunshine all is well again. If I could forever avoid cities and live within the peace and quiet of the countryside I would be very happy indeed. I like the image of you "hoover"ing around McDonalds and doing battle with the local kids for a seat. HA! Yeah upon re-looking at the picture I can see where you're coming from Ross. I'd like to assure readers that Sharon is not in the business of making lewd gestures and this was an unfortunate coincidence. Haa yes it is true that I should be grateful I have hair enough to stick up on end. I had to stare at the pic for ages trying to figure at what was rude about it. I did eventually twig but in my defence the length if took me to see it shows my complete innocence. She can't be that innocent Ian, she feels guilty about everything.